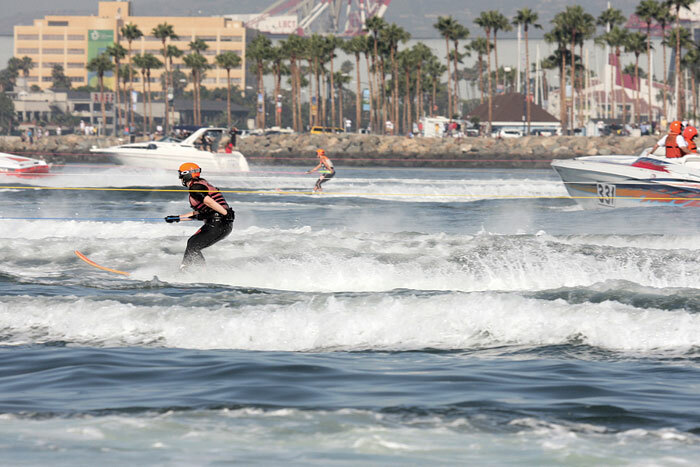 LONG BEACH — Powerboaters and waterskiers from around the world will compete in the 65th annual Catalina Water Ski Race, July 20, hosted by Long Beach Boat and Ski Club. The 62-mile challenge — with fast powerboats towing waterskiers from Long Beach to Avalon and back — will start at 8:53 a.m. between Island White and Island Grissom in Long Beach Harbor. There will be a split start, with 21-foot and smaller boats starting first, and larger boats up to 43 feet starting at 9 a.m. Boats will tow skiers to Avalon’s Descanso Beach before heading back to the finish line in Long Beach, off Queen Mary’s bow. There are 19 different classes for participants — ranging from novices to experts, and masters (age 60 or older) to juniors (age 15 or younger). Pre-event activities will begin at 9 a.m. July 19 with the 19th annual Special Needs Children’s Day, at Long Beach Marine Stadium. The day will include many water-related activities, prizes and food for children participating. Racer sign-ins and skier sear safety inspections are scheduled from 10 a.m.-3 p.m. July 19 at the Hotel Maya Solstice Room. Race boat inspections will take place from noon-3 p.m. July 19 at the launch ramp area near Hotel Maya. All boats must be on trailers. A driver, observer and navigator meeting is set for 4:30 p.m. July 19 at the Hotel Maya Salon de Reyes. Race day festivities will open with a ski team parade at 7 a.m. July 20 A post-race trophy presentation is scheduled for 4 p.m. at Hotel Maya. For more information, visit catalinaskirace.net.